What will Clive be today? 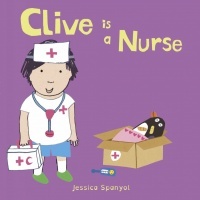 Follow Clive and his friends as they explore the many things a nurse does in a day. Role-play is crucial to a child’s positive development, boosting language and social skills, and building self-confidence. This humorous and caring interaction of an inclusive group of playmates will inspire young readers to create their own diverse roles, free of gender stereotypes.